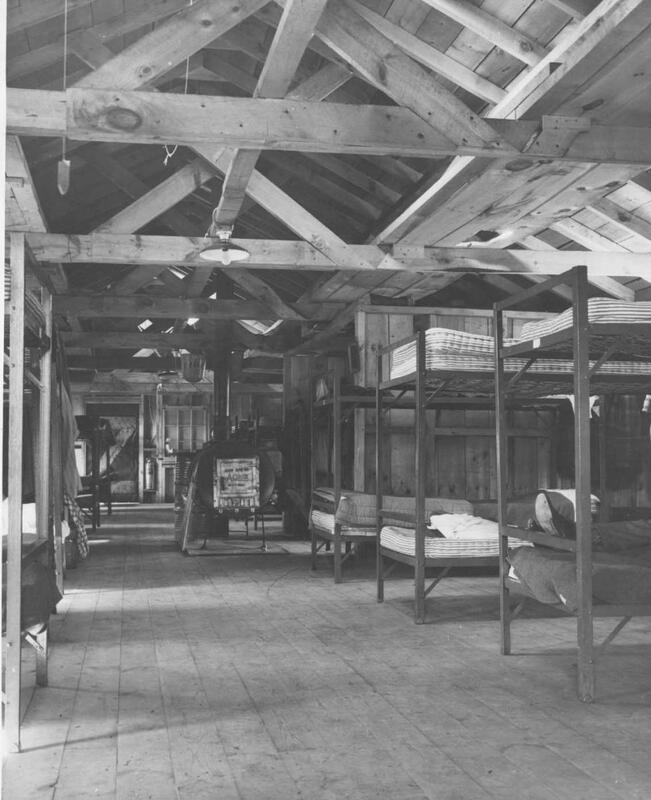 Interior of Dormitory at Petersham--picture taken before all boys had arrived. CPS Camp No. 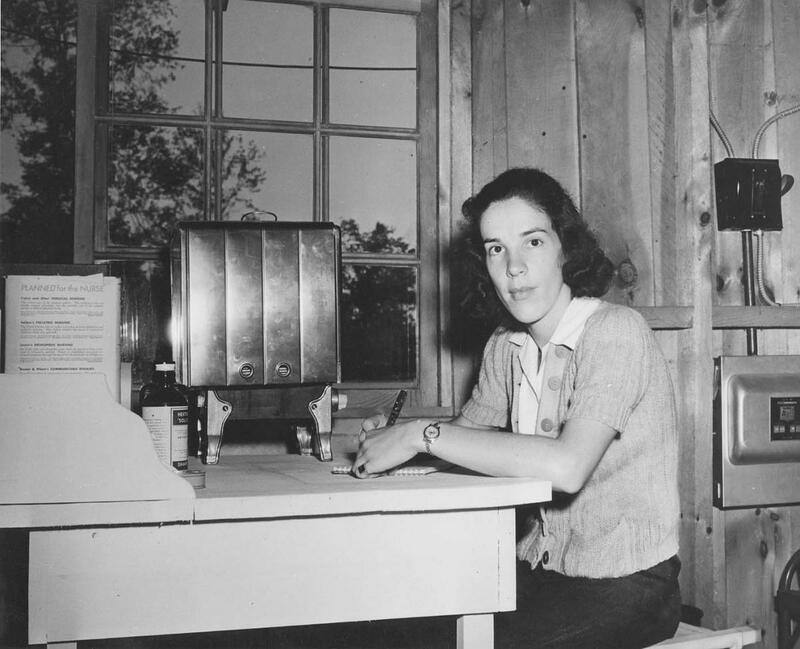 9, a Forest Service base camp, located in Petersham, Massachusetts and operated by the American Friends Service Committee, opened in June 1941 and closed in October 1942. Men cleared fire debris left by the 1937 New England hurricane. CPS Camp No. 9, a Forest Service base camp near Petersham, Massachusetts, was in the Harvard Forest and Swift River Valley. Some of the early work of CPS men was to clear fire debris left by the New England 1937 hurricane. Some men became specialists in telephone maintenance, including repairing lines to ranger stations and stretching new lines for system improvement. Some staffed lookout towers and participated in fire fighting. The men were scheduled to build ten water-holes by October, to be followed with fire inspection and maintenance of the government lumber yards housing the hurricane timber fall. 3) “determine by cost accounting, the expense of making this lumber merchantable”. The men decided to organize their camp life into six standing committees as reported in the same issue of Days of Our Year. The men had already begun French and Spanish classes and established two reading-studying groups. They were organizing a music group, a theatre group, and a speaker series on “pacifism and contemporary affairs”. Petersham men remained active in the larger CPS community, hosting one regional meeting to talk about issues and problems in CPS. The agenda for the March 1942 meeting (with representatives from Cooperstown in New York, Stoddard in New Hampshire, Royalston and Ashburnham in Massachusetts) included Administration issues (weekends, use of private and AFSC cars, camp-staff relations and camp discipline). The two day session also provided time to discuss self-subsistence, public relations, purposes of camps, as well as areas of cooperation. The men published the camp newspaper Days of Our Year beginning in September 1941 and ending in October 1942. Days of Our Year, Civilian Public Service Camp Nine, Petersham, Massachusetts, (September 5, 1941); Vol. I No. 15 (March 1, 1942); Vol. I No. 16 (March 21, 1942); Vol. II, No. 2 (August 26, 1942) in the Swarthmore College Peace Collection, American Friends Service Committee: Civilian Public Service Records (DG002), Section 3, Box 3.